Two women remain in hospital with serious injuries after a crash on Slack Hill, police have said. Officers were called to a report of a collision between a Skoda Fabia and a Mini Cooper on Amber Lane, known locally as Slack Hill, in Ashover at 11.55am yesterday (Tuesday). 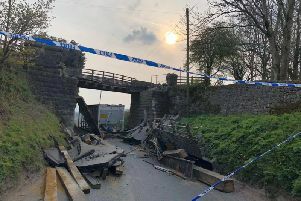 A police statement said: “The driver of the Fabia, an 85-year-old man and his two passengers, women aged 80 and 87, were removed from the car by Derbyshire Fire and Rescue Service. "The two women were taken to Northern General Hospital in Sheffield, where they remain, with serious injuries. The man did not require hospital treatment.